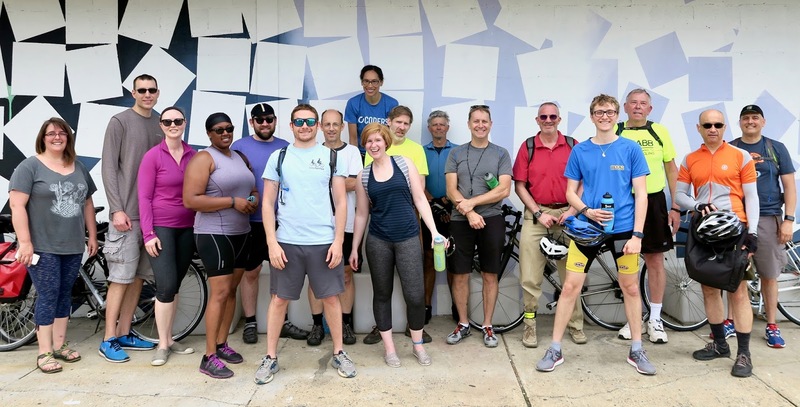 FABB and the Association of Pedestrian and Bicycle Professionals DC chapter held a joint ride on Saturday to explore new and planned bike infrastructure in the Annandale area (route map). The group of 18 riders met at East Falls Church Metro station. Fairfax County Bike Coordinator Adam Lind and FABB's Dave Wagoner led the group, with Adam stopping periodically to offer insights into the planning and implementation of the new facilities. We passed through neighborhood streets south to the service road on Route 50 to new bike lanes on Annandale Road, making our way to Gallows Road and on to the Annandale business district. We stopped for lunch at the trendy new eating place The Block, reviewed in the Post back in Februrary. Unfortunately there was no bike parking, something we'll need to advocate for in the future. From there part of the group took a longer loop south along new bike lanes on Ravensworth Rd and Heritage Dr, then north to Hummer Rd where bike lanes are planned. Just before returning to East Falls Church the two groups rejoined. The ride was a great opportunity to meet cyclists from around the area, many of whom are advocating for better bike conditions. Glad that Greg Billing, WABA Executive Director could join the ride along with several folks from APBPDC including some staff from Toole Design Group, the company that helped the county put together our bike map and Bicycle Master Plan. Thanks to Adam and Dave for working together on the ride, and to APBPDC for co-sponsoring. Adam announced that the county bike program will soon be sponsoring similar rides around the county this summer.